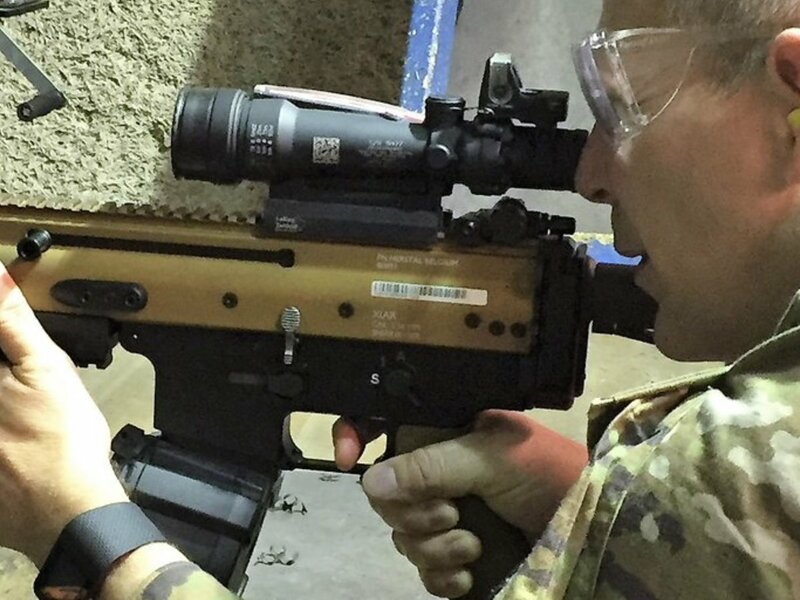 Program Executive Officer (PEO) Soldier out of Fort Belvoir, Virginia recently tweeted an image depicting U.S. Army Brigadier General Anthony Potts (currently commanding PEO Soldier) on the test range firing a test rifle apart of “emerging technologies for Next Generation Squad Weapon” as spelled out in the tweet. Upon closer inspection of the weapon pictured, it appears that it is in fact a version of the 5.56x45mm NATO HAMR-16 (Heat Adaptive Modular Rifle) that FN Herstal introduced into the Marine Corps’ IAR competition, now almost a decade old. There are three points that positively identify this weapon as a HAMR-16. The largest one is the black lower receiver that the HAMR-16 was instantly recognized for. The second are the three back screws in horizontal proximity to each other just below the rear sight on the upper receiver. 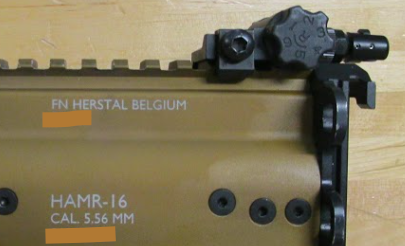 Unlike a standard SCAR-L, or Mk.16, which doesn’t have these three extra screws. Next up is the bulged heat shield that has an M1913 Picatinny rail mounted at the 6 o’clock position on the handguards of the upper receiver. Rather than a normal heat shield, this is actually integral to the operation of the initially closed bolt design, then transitioning to an open bolt operation once the temperature of the chamber has reached a certain level. Then again back to closed bolt when that same temperature has receded to a safe level of operation. This process is instrumental to not providing grounds for a cook-off due to firing at the rapid or cyclic rate. If we also look very closely at a cropped portion of the main image, we see on the receiver what appear to be the words “XLAR” that have replaced the nomenclature “HAMR-16” on the original automatic rifles. Note the three screws located horizontally to each other. There has also been a plastic barcode added to the PEO test example. So what has actually be modified or updated from the original HAMR-16? The only visible difference is a buttstock with a mil-spec buffer tube that appears to be compatible with an M4 telescoping stock. There also appears to be a clamp attached to the exposed portion of the muzzle, but this was common on some barrels on the HAMR-16 as well. Outside of the rifle there appears to be a Magpul D60 PMAG inserted, a Harris bipod, and what appears to be a forward vertical pistol grip. In addition there is a Trijicon SDO with an RMR optic mounted on top of it. The SDO is most likely in 3.5X, similar to exactly what the Marine Corps is using for the M27. 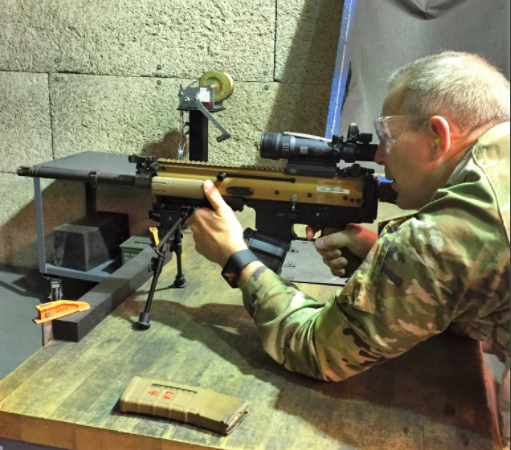 Upon reaching out to FN Herstal, TFB has learned that this was simply a demonstration of capabilities for PEO Soldier and not an in-depth competition or testing process. As verbatim from the e-mail we got back, “There are no plans to resurrect this”. Much Thanks to Abraxas Spa for this Easter Egg!